This article is about the eighth-generation console. For the first Xbox console, see Xbox (console). The Xbox One is an upcoming video game console from Microsoft. Announced May 21, 2013, it is the successor to the Xbox 360 and the third console in the Xbox family of consoles. The Xbox One will directly compete with Sony‘s PlayStation 4 andNintendo‘s Wii U, as part of the eighth generation of video game consoles. The Xbox One will feature compatibility with the x86-64 instruction set, a Blu-ray Disc drive and 8 GB of unified memory in the form of DDR3. It is scheduled for release by the end of 2013. The developer kit for this console was codenamed Durango. The Xbox One was formally revealed on May 21, 2013,with additional information to follow at E3 on June 11–13. The Xbox One uses a two-tone “liquid black” finish; with half finished in a matte grey, and the other in a glossier black. The design of the Xbox One’s components were designed to evoke a more entertainment-oriented and simplified design than previous iterations of the console; among other changes, the LED rings used by the Xbox 360 are replaced by a glowing white Xbox logo used to communicate the system’s status to the user. The Xbox One has an APU with eight x86-64 cores, 8 GB of DDR3 RAM with a memory bandwidth of 68.3 GB/s, a 500 GB non-replaceable hard drive, and a Blu-ray Disc optical drive. Three GB of the RAM will be reserved for apps and OS, leaving 5 GB for games. The graphics processing unit (GPU) is based on an AMD GCN architecture with 12 compute units, which have a total of 768 cores, providing an estimated peak theoretical power of 1.23 TFLOPS. The Xbox One will support 4K resolution (3840×2160) video output and 7.1 surround sound. Yusuf Mehdi, corporate vice president of marketing and strategy for Microsoft, has stated that there is no hardware restriction that would prevent games from running at 4K resolution. The Xbox One will support HDMI 1.4 for both input and output. The Xbox One does not have a video output for either composite video or component video. The Xbox One will ship with an updated version of the Kinect sensor; the new Kinect uses a 1080p wide-angle time-of-flight camera (in comparison to the VGA resolution of the previous version), and processes 2 gigabits of data per second to read its environment. The new Kinect has greater accuracy over its predecessor, can track up to 6 skeletons at once, perform heart rate tracking, and track gestures performed with an Xbox One controller. The Kinect microphone will remain active at all times so it can receive voice commands from the user when needed, even when the console is in sleep mode (so it can be woken back up with a command). The Xbox One will not function unless the Kinect sensor is connected. However, users retain the software capability to turn off all Kinect functions while the sensor remains connected to the console. The device will run three operating systems: Xbox OS, an OS based on the Windows kernel, and another OS that will allow the other two operating systems to communicate by virtualisation (as a hypervisor). Such integration will include features like snapped Skype calls while in game. The Windows edition on the Xbox will not be compatible with standard Windows apps, though developers will be able to port them over with little effort. The Xbox One’s controller is a similar design to the Xbox 360, but with numerous new features. The battery is integrated into the body of the controller, so there’s no longer a bump. The controller’s directional pad has been overhauled to provide better resistance. Developers will be able to include varying levels of rumble feedback through Impulse Triggers. Xbox 360 controllers will not be compatible with the Xbox One. The Xbox Live service is scaled up to use 300,000 servers for Xbox One users from 15,000 that handle the Xbox 360 users. Cloud storage will be offered to save music, movies, games and saved content and developers will be able to use Live servers to offer more “living and persistent worlds.” The service will still be subscription-based. The friends list will expand to 1,000 friends. Included in the system is a digital video recorder (DVR) which allows the recording of gameplay. These videos can then be edited with built-in video editing tools and shared with friends through the Xbox Live service. At this point the DVR will not be able to record video from cable, over the air, satellite, etc. Microsoft entertainment boss Yusuf Mehdi said “Microsoft would be reaching out to the TV guys to get additional features, like DVR recording and playback”. The Xbox One will not be backward compatible with Xbox 360 content, as the systems use different core architectures. The Xbox 360 uses a PowerPC architecture while the Xbox One uses a x86-based one. Phil Harrison has stated that game discs could be installed and played on more than one console. Games are tied to both Xbox One consoles and Xbox Live accounts.An unlock fee will be charged to play a registered game under a different Live account on a different Xbox One console. The PlayStation 4 (Japanese: プレイステーション4 Hepburn: Pureisutēshon Fō?, officially abbreviated as PS4) is an upcomingvideo game console from Sony Computer Entertainment. Announced as the successor to the PlayStation 3 during a press conference on February 20, 2013, the PS4 is expected to launch in the fourth quarter of 2013, and will compete with Nintendo’sWii U and Microsoft’s Xbox One. Moving away from the Cell architecture, the PlayStation 4 will be the first in the Sony series to feature compatibility with the x86-64 instruction set, which is a widely used platform common in many modern PCs. The idea is to make video game developmenteasier on the next-generation console, attracting a broader range of developers. These changes highlight Sony’s effort to improve upon the lessons learned during the development, production and release of the PS3. Other notable hardware features of the PS4 include 8 GB of unified memory in the form of GDDR5, a faster Blu-ray Disc drive, and dedicated custom chips for processing audio, video and background downloading. Among new applications and services, Sony plans to release the PlayStation App, allowing PS4 owners to turn smartphonesand tablets into a second screen to enhance gameplay. The company also plans to debut Gaikai, a cloud-based gaming service that hosts downloadable content and games. By incorporating a share button on the new controller and making it possible to view in-game content being streamed live from friends, Sony plans to place more focus on social gameplay. According to lead system architect Mark Cerny, development on Sony’s eighth-generation video game console began as early as 2008. Less than two years earlier, thePlayStation 3 had launched after months of delays due to issues in production. The delay placed Sony almost a year behind Microsoft’s Xbox 360, which was already approaching 10 million units sold by the time the PS3 launched. PlayStation Europe CEO Jim Ryan said Sony wanted to avoid repeating the same mistake with PS3’s successor. In 2012, Sony began shipping development kits to game developers consisting of a modified PC running the AMD Accelerated Processing Unit chipset. These development kits were known as Orbis. In early 2013, Sony announced that an event known as PlayStation Meeting 2013 would be held in New York on February 20, 2013, to cover the “future of PlayStation”. Sony officially announced the PlayStation 4 at the event. They revealed details about the PS4’s hardware and discussed some of the new features it will introduce. Sony also showed off real-time footage of games in development, as well as some technical demonstrations. They expect to release the console in the fourth quarter of 2013. Sony will release more information about the PS4 on June 10, 2013 at the E3 Expo, as well as showing the device itself. A 39-second teaser, published on Sony Computer’s official YouTube channel, showed parts of the console, as well as the date and time of the reveal event. The console design was not revealed at the press conference, since the design and specifications are still being finalized. However, some technical specifications about the console have been announced. The technology in the PlayStation 4 will be relatively similar to the hardware found in personal computers in many respects. This familiarity should make it easier and less expensive for game studios to develop games for the PS4. The PlayStation 4 will utilize a semi-custom accelerated processing unit (APU) developed by AMD in coordination with Sony. Its APU will be a single-chip solution that combines a CPU and GPU, as well as other components such as a memory controller and video decoder. The central processing unit (CPU) consists of eight x86-64 cores based on the upcoming Jaguar CPU architecture from AMD. The graphics processing unit (GPU) consists of 18 compute units to produce a theoretical peak performance of 1.84 TFLOPS. This processing power can be used for graphics, physics simulation, or a combination of the two. Eurogamer calls the graphics technology in the PS4 “impressive” and an improvement from the difficulties developers experienced on the PlayStation 3. The console also includes a secondary custom chip which handles tasks associated with downloading, uploading, and social gameplay. These tasks can be handled seamlessly in the background during gameplay or while the system is insleep mode. The PS4 will contain 8 GB of GDDR5 unified system memory with a maximum bandwidth of 176 GB/s. This is 16 times the amount found in the PS3, and is expected to give the console considerable longevity. The unified memory architecture allows the CPU and GPU to access a consolidated memory, removing the need for separate, dedicated memory pools. The non-unified memory architecture of the PS3 was reportedly problematic. The read-only optical drive will read Blu-ray discs at 6x CAV for a maximum read speed of 27 MB/s – a significant upgrade from the PS3’s 2x speeds that were capped at 9MB/s. Early reports indicate that the Blu-ray Disc drive will not be capable of reading quad-layer 100 GB discs, a new Blu-ray Disc technology designed to support 4K resolution. Although the console will support photos and videos at 4K resolution, the system is not expected to be able to render games beyond 1080p. A storage drive will also be included, though Sony has not announced the size or type. The PlayStation 4 will feature 802.11 b/g/n wireless network connectivity, Ethernet (10BASE-T, 100BASE-TX and 1000BASE-T), Bluetooth 2.1, and an unspecified number ofUSB 3.0 ports. An auxiliary port will also be included for connection to the PlayStation 4 Eye, a motion detection digital camera device first introduced on the PS3. A mono headset, which can be plugged into the DualShock 4, will come bundled with the system. Output options include HDMI, analog audio/video, and optical S/PDIF. The DualShock 4 will be the PlayStation 4’s main controller. Similar to the DualShock 3, it will connect to the console via Bluetooth 2.1+EDR. The DualShock 3, however, will not be compatible with PS4. The DualShock 4 will be equipped with several new features, including a built-in two-point capacitative touch pad on the front of the controller, which can be clicked. The controller will support motion detection via a three-axis gyroscope and three-axis accelerometer and improved vibration. It will include a non-removable, rechargeable lithium-ion battery tentatively capable of storing 1000 mAh. The tentative design weighs 210 g (7.4 oz), has dimensions of 162 × 52 × 98 mm (6.4 × 2.0 × 3.9 in), and has a rubber or etched plastic backing to enhance grip. The design shown at the PlayStation 4 reveal event was “near final”. However, the DualShock 4 will not be demoed until around E3 2013. The controller will feature several output connectors. Its stereo jack (3.5 mm TRS connector) will support the connection of a headset to allow a user to speak and hear audio simultaneously. A micro USB port, an extension port, and a mono speaker will also be included. The controller can be charged via micro USB, a dedicated charging station, or the console (even when the console is off). The DualShock 4 will feature the following buttons: PS button, SHARE button, OPTIONS button, directional buttons, action buttons (triangle, circle, cross, square), shoulder buttons (R1/L1), triggers (R2/L2), analog stick click buttons (L3/R3) and a touch pad click button. These mark several changes from the DualShock 3 and other previous PlayStation controllers. The START and SELECT buttons have been merged into a single OPTIONS button. A dedicated SHARE button will allow players to upload video from their gameplay experiences. The joysticks and triggers have been redesigned based on developer input. The joysticks now will feature a concave surface. The DualShock 4 will also feature a light bar that can display different colors. The colors will help identify players and alert them with critical messages such as low health. It also will interact with a camera attachment that perceives movement and depth by using the controller’s light bar. It is based on the existing technology used in the PlayStation Move. Existing PlayStation Move controllers will be supported on the PS4. The PlayStation Eye has been redesigned. It will include two 1280×800px cameras. The lenses will operate with an aperture of f/2.0, with 30 cm focusing distance, and an 85°field of view. The dual camera setup will allow for different modes of operation, depending on the target application. The two cameras can be used together for depth-sensing of objects in its field of vision, akin to the Microsoft Kinect. Alternatively, one of the cameras can be used for generating the video image, with the other used for motion tracking. The PlayStation 4 Eye will also feature a four-channel microphone array, which helps reduce unwanted background noise and may even be used to issue commands. It is tentatively set to be 186 × 27 × 27 mm (7.3 × 1.1 × 1.1 in) (width × height × depth), with a weight of 183 grams (6.5 oz). It will record video in RAW and YUV (uncompressed) formats and will connect with the PlayStation 4 via the console’s auxiliary port. Sony plans to ship the PlayStation 4 Eye bundled with the console, rather than being a separate accessory. A variety of devices, such as smartphones, tablets, and the PlayStation Vita, can interact with the PlayStation 4 as second screens. Companion devices can also wake the console from sleep mode. The PlayStation Vita can be used for streaming video directly from the console to the handheld, allowing supported games to be played remotely. Sony hopes to make all PS4 games playable on the PlayStation Vita. Developers can add Vita-specific controls for use via Remote Play. The PlayStation App will allow mobile devices to interact with the PlayStation 4, similar to Xbox SmartGlass. It will be available for iOS and Android smartphones and tablets. Gamers can use this application to, for example, purchase PS4 titles while away from home and have them remotely downloaded to the console, watch live streams of other gamers, and view in-game maps while playing games. Sony intends to expand and evolve the services it offers over the PlayStation 4’s lifespan. Although the PS4 does not require a link to the internet, Sony has commented that the experience is much richer if you are connected. The PlayStation Network (PSN) will allow players to access a variety of cloud-based services from the PlayStation Store including Sony’s Music Unlimited and Video Unlimited subscription services. Customers can browse titles on the PlayStation Store and stream games via Gaikai to try them out almost instantaneously. The user interface on the PlayStation 4 will be revamped, with items such as the XrossMediaBar removed from the layout. 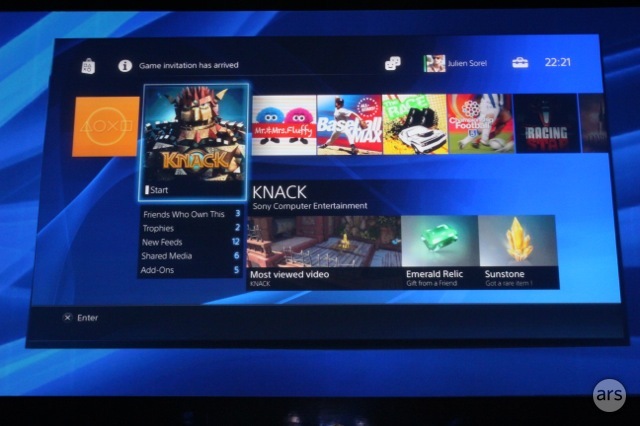 The design instead will resemble the latest PSN interface available at the time of the announcement. 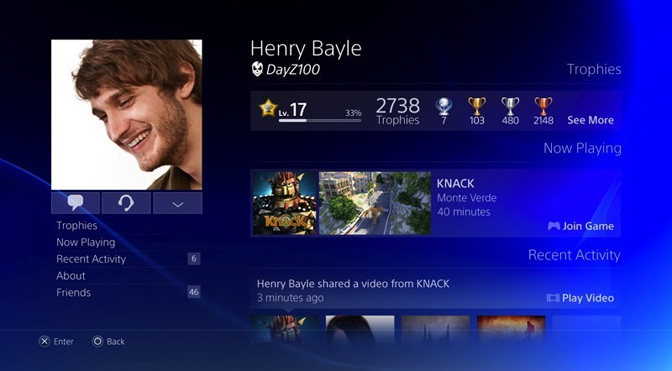 The PS4 home screen will also feature personalized content from friends. Services from third-party vendors, such as Netflix and Amazon Instant Video, will also be accessible within the new interface. In addition, it will also be possible to multitask during gameplay, such as opening a web browser while playing a game. The user profile for players will be improved, showing recent activity, their full name and other details in addition to their unlocked Trophies, as the unveiled PS4 user-interface has revealed. “Social” was one of the five major principles discussed by Sony. Although the console will feature social functionality, the features are optional and can be disabled. Gamers will have the option to use real names with friends, in addition to a nicknamein other situations when anonymity is important. The DualShock 4 controller includes a SHARE button, allowing the player to cycle through the last several minutes of gameplay to select a screenshot or video clip appropriate for sharing. Media is uploaded seamlessly from the console to other PSN users or social networking sites such as Facebook and YouTube. Gamers can browse live video of titles their friends are playing, spectate or assist in their game to help them overcome obstacles, and broadcast live video of their own games via public services such as Ustream, allowing friends to view and comment on them from other web browsers and devices. Sony hopes to make it easier for independent game developers to develop titles for the PS4. Sony Computer Entertainment of America chief executive officer Jack Tretton said games for the PlayStation 4 will range in price from US$0.99 to $60.00. The system will feature downloadable content similar to what is available on other PlayStation platforms. In addition to physical media that can be picked up in store, all PlayStation 4 games can be downloaded online, plus every game can be sampled for free. Sony will not prohibit the usage of second-hand games purchased in physical form. When a digital title is selected, only a portion of the game data has to be transferred to the system before it can be started (e.g. the first level), with the remaining parts downloading during play, reducing waiting time. If users prefer to play their game directly from the Blu-Ray disc, PlayGo will install data to the hard drive during play, thereby eliminating loading times. This is accomplished via the system’s background processor. Similarly, system updates are downloaded seamlessly in the background without interruption. The PS4 also features technology that attempts to determine trends, including titles a gamer is likely to express interest in next, and then automatically download a small percentage of those games in the background, even in sleep mode, in order to save time. The PlayStation 4 will not initially include the ability to support previous PlayStation console games. Sony has instead detailed plans to explore cloud-based emulation of previous generations as a long-term solution to the challenges of backwards compatibility. The firm has yet to also rule-out on-console emulation of previous generations. Sony is planning to launch a cloud-based streaming service through Gaikai, a company acquired by Sony in July 2012. The service will emulate and render previous generations of PlayStation games, streaming them to the PS4 and, likely, the Vita, over the internet. Multiple titles are currently in development for the PlayStation 4. Some publishers have indicated that they are developing titles for the PS4 without explicitly stating what those titles will be. Sony says they have “every” significant third-party developer supporting the PS4. The following titles are confirmed to be in development for the PlayStation 4.